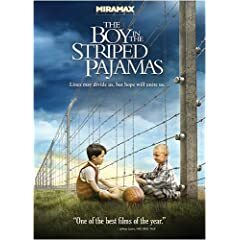 Burbank, California, January 2, 2009—A touching and unforgettable tale of a forbidden friendship between two children divided by war, The Boy in the Striped Pajamas comes to DVD on March 10, 2009 from Walt Disney Studios Home Entertainment. Set during World War II, the story is seen through the eyes of the eight-year-old son of a concentration camp commandant, whose pact with a Jewish boy has heart-wrenching consequences. Bonus features, including an exclusive look at the creation of the film, add to a powerful and poignant movie experience. The Boy in the Striped Pajamas stars Asa Butterfield as eight-year-old Bruno, with Vera Farmiga (The Departed, Nothing But the Truth), and David Thewlis (Kingdom of Heaven, the Harry Potter franchise) as his parents, and Jack Scanlon as his friend, Shmuel. Farmiga earned a Best Actress award from the British Independent Film Awards and the film collected two additional nominations for Most Promising Newcomer (Butterfield) and Best Director for Mark Herman (Little Voice, Brassed Off). It received the Audience Choice Award at the 2008 Chicago International Film Festival. The Boy in the Striped Pajamas is based on the internationally bestselling novel by John Boyne. When his father (David Thewlis,) a high-ranking Nazi officer, is assigned to oversee a farm in the countryside, eight-year-old Bruno (Asa Butterfield) misses the excitement and camaraderie he knew in his hometown of Berlin. Lonely and bored, Bruno secretly explores his new surroundings and discovers the farm is surrounded by barbed wire. When he sees Shmuel (Jack Scanlon), a boy his own age, working behind the fence, he strikes up a tentative friendship, playing checkers and catch through the barbed wire. As Bruno slowly realizes that his new friend is Jewish, he becomes confused by the Nazi doctrines his tutor espouses and suspicious of the real purpose of the farm. When Shmuel needs his help, the boys form an outrageous plan that comes to a devastating conclusion. Intelligent, thoughtful and haunting, The Boy in the Striped Pajamas is an unforgettable portrait of a child trying to navigate in an increasingly complex and shadowy adult world. Friendship Beyond the Fence—This behind-the-scenes featurette shows how filmmakers balanced the tale of Bruno, the lonely son of a Nazi officer, and the sensitive reality of one of the darkest periods in world history to create an unforgettable motion picture. Deleted scenes—With commentary by director Mark Herman. Audio Commentary—Director Mark Herman and author John Boyne discuss the film. below. Last date for entries is March 18, 2009.